Copley seldom painted children. 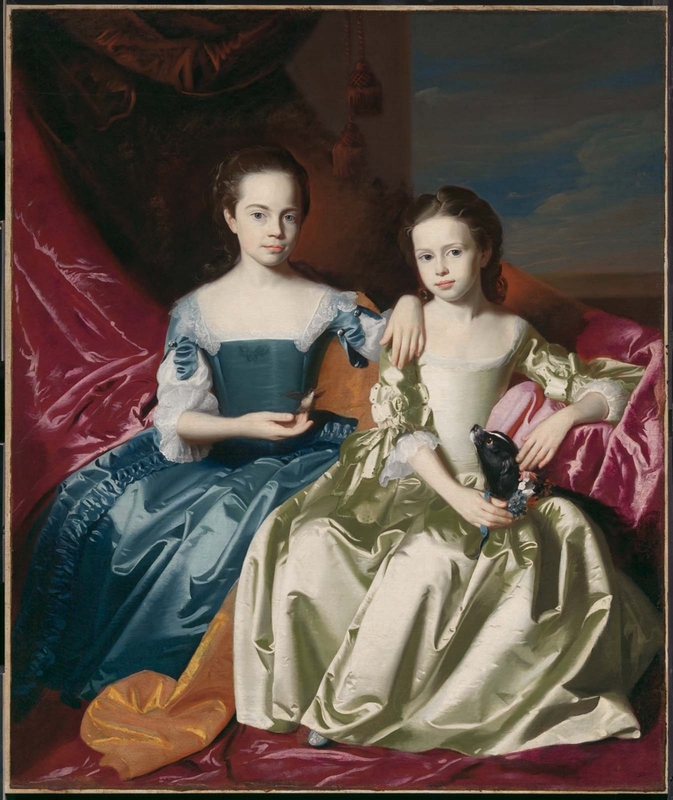 His portrait of Mary and Elizabeth Royall is even rarer for showing two children, the teenaged daughters of Isaac Royall, Jr., of Medford, Massachusetts, one of the richest merchants in New England. Royall was a sociable man who loved to entertain in his grand Georgian mansion near the Mystic River in Medford (extant and open to visitors); in 1769, he [39.247]and his wife Elizabeth (Virginia Museum of Fine Arts, Richmond) would also pose for Copley. Royall’s love for fine things is evident in the portrait he commissioned of his daughters, which was designed to show off the family’s wealth and social status: the girls are dressed in expensive silk gowns trimmed with imported lace, and the velvet drape behind them was intended to bring to mind portraits of English aristocrats who had themselves painted in such a setting. Even the pets in the picture conveyed status: the King Charles spaniel was a favorite of British royalty, and the hummingbird perched on Mary’s finger may have been imported from the West Indies, where Royall conducted profitable trade. The obedient pets and the girls’ modest demeanor were also meant to indicate the girls’ character, showing them to be polite, disciplined, well-mannered young women—good daughters and good future wives. This projection did indeed come to pass: Mary (on the left) married George Erving in 1775 and her younger sister Elizabeth married William Pepperell, the son of Nathanial Sparhawk [1983.595], in 1767. Threatened by the outbreak of the Revolution, Mary and her husband left Boston with her father Isaac Royall, first for Halifax and later for England. Elizabeth, already the mother of four children, died of dysentery in 1775, her Loyalist husband claiming that her early death was caused by food shortages attributable to the revolutionary boycott of British goods. He also left for England, later commissioning Copley to paint a family portrait that included a posthumous likeness of Elizabeth (1778, North Carolina Museum of Art, Raleigh). This text was adapted and expanded by Erica E. Hirshler from Carol Troyen and Janet L. Comey, Amerikakaigakodomo no sekai [Children in American art], exh. cat. (Nagoya, Japan: Nagoya/Boston Museum of Fine Arts, 2007).